A former speaker of the Hawaii House of Representatives will resign by next week to resolve sexual harassment allegations brought by several women, the latest case of an elected official being forced from office over misconduct. The Hawaii State Ethics Commission on Wednesday announced the settlement in its investigation of state Rep. Joseph Souki of Maui, a Democrat. The investigation included allegations Souki, 86, sexually harassed multiple women by subjecting them to unwanted kissing, touching and sexual language. Sexual misconduct allegations against movie producer Harvey Weinstein in October have led women around the country to come forward with claims against powerful men in politics, entertainment, business and media. Since 2017, at least 23 state lawmakers have resigned or been expelled from office amid sexual misconduct or harassment allegations. That includes the 17 who left office since reports about Weinstein's misconduct. The settlement calls for Souki to resign by March 30, issue a public apology, pay a $5,000 penalty and not seek office for two years. According to the settlement, Souki admitted he "touched and kissed more than one woman in ways that were inappropriate and unwelcome. He admits that this physical contact exceeded the boundaries of the customary 'aloha kiss.'" He also admitted making "sexual comments, including comments on the physical appearance of more than one woman, that were inappropriate and unwanted." But Souki said Wednesday he has "absolutely no memory of ever acting inappropriately with any women at any time, as a member of the House or in a private setting." He is saddened something he did was misunderstood to be inappropriate, he said. "He's agreed to take responsibility for what they've accused him of, but frankly, doesn't remember the incidents," said Souki's attorney, Michael Green. The commission found Souki likely violated the state's Fair Treatment Law, which says a lawmaker cannot use his or her position to obtain unwarranted benefits or to subject another person to unwarranted treatment, either favorable or unfavorable. The investigation began when Rachael Wong, the former head of Hawaii's Department of Human Services, filed a sexual harassment complaint against Souki. The commission says similar allegations from other women followed. Wong said in a statement Wednesday that Souki made inappropriate comments about her physical appearance and an inappropriate request for physical contact when she was human services director. She declined to provide more details. She said she's heard from other women who suffered from the abuse of power at the Hawaii Legislature. "Yet every single one of the local women with whom I've spoken share that they were not and still do not feel able to come forward publicly," Wong said. "How can we be okay with that in our islands?" Souki was first elected in 1982 and has served continuously since then. He was House speaker from 1993-99 and again from 2013-17. Souki said he hadn't planned to run for re-election so he would have been leaving the House later this year. The report from the commission says when Souki was speaker, women were reticent to confront him or file a complaint regarding his conduct. It noted Wong was responsible for a budget of $3.3 billion. "Challenging then-Speaker Souki's conduct could have jeopardized her agency's budget and legislation thereby impairing her advocacy efforts on behalf of Hawaii's children and families," the report said. "She, like others, felt she had no choice but to remain silent in the face of Respondent Souki's behavior." Souki's official biography on the Legislature's website says he was born and raised on Maui. He is married with two children. 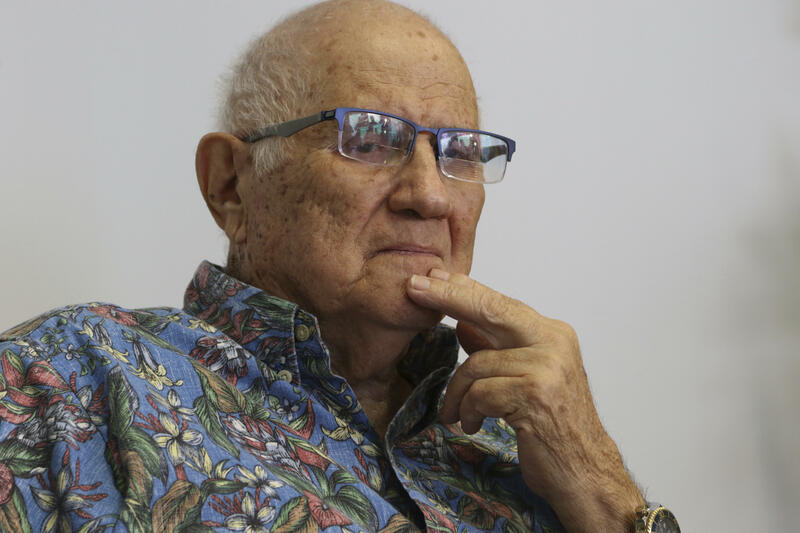 "I have made the difficult decision to avoid a media circus by stepping down without a public confrontation with my accusers," Souki said, adding that he doesn't want to put his family through public hearings. Souki said some people will conclude he did something wrong because he's resigning but he can't control that. Souki said it would take a long time and it would be expensive to fight the allegations. He said doing so would hurt his accusers, his family and his friends. Green argued there was no way for his client to receive due process in the case, especially when some allegations were for conduct eight years ago. Green said that's a long enough ago that people wouldn't remember what happened. He argued "there's no way" the ethics commission wouldn't find a violation if his client challenged the allegations under the current system. He said Souki's House colleagues would then be in the difficult position of voting on whether to expel Souki and face the wrath of voters if they voted against. "You cannot win when this happens," Green said. Daniel Gluck, the ethics commission's executive director, told reporters anyone who is accused may have an open hearing if he or she believes the evidence doesn't justify the charges. The current House speaker, Rep. Scott Saiki, said his chamber takes a "zero tolerance approach" to workplace harassment. "It is regrettable that a legislative career that spanned 36 years is ending in such a manner," Saiki said. Hawaii Gov. David Ige thanked the ethics commission for "a fair and thorough investigation." He commended Wong for her "courage and leadership in giving voice to harassment victims and increasing awareness across the state."